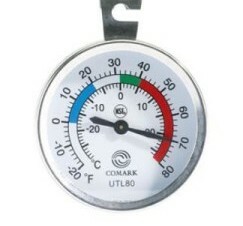 This refrigerator and freezer thermometer is ideal for making sure that your cold kept foods stay at the correct temperature for safety and quality. This refrigerator and freezer thermometer has a temperature range from -20 to 80 degrees so you can keep track of unsafe temperatures. This thermometer is great for reach in freezers and refrigerators and even comes with double sided tape for no hassle mounting! 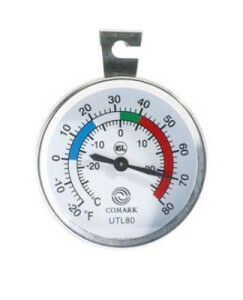 This refrigerator and freezer thermometer also features HACCP zones.